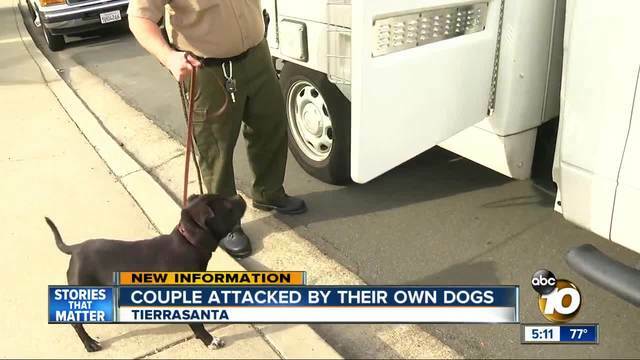 SAN DIEGO (KGTV) - An elderly Tierrasanta couple suffered severe injuries Tuesday when they tried to stop a fight between their two dogs. The male and female STAFFORDSHIRE BULL TERRIERS began fighting around noon at the home on Pallon Way. The dogs' owner, a man in his 70's, was bitten when he tried to break up the fight. The man's wife was also bitten when she stepped in. Both suffered severe bites and were taken to the hospital. Neighbors say the couple adored the dogs, and according to the County Animal Services, they have made the agonizing decision to relinquish the dogs for euthanasia because of the severity of the bites and past incidents of fighting each other. Pit bulls fight? What? NO! They must have been trained to do that! Let's throw the owners under the bus. Bad owners! The bad owners must be punished! The pit bulls were neglected, abused, not raised right! Punish the owners, not the breed! The sane advice is, elderly people should not own pit bulls. If pit bulls start fighting, do not intervene; the pit bulls will redirect. Call 911!